The Zambia Information Communication and Technology Authority (ZICTA) and the Competition and Consumer Protection Commission (CCPC) has commenced investigations into criminal conduct by Airtel Networks Zambia. This follows the lodging of a criminal complaint against the Mobile Phone Company by Lusaka Journalist Thomas Zgambo. According to a letter dated September 11, 2017 Mr. Zgambo formally complains that between the years 2013 and 2014, Airtel Networks Zambia diverted data in form of messages to and from his mobile phone number 0972354292 to some numbers registered in the name of Evaristo Phiri. Mr. Zgambo in his letter further states that other third parties had their privacy invaded by the virtue of them communicating to him. ZICTA in its response to Mr. Zgambo says it has formally launched investigations into the criminal conduct by Airtel. 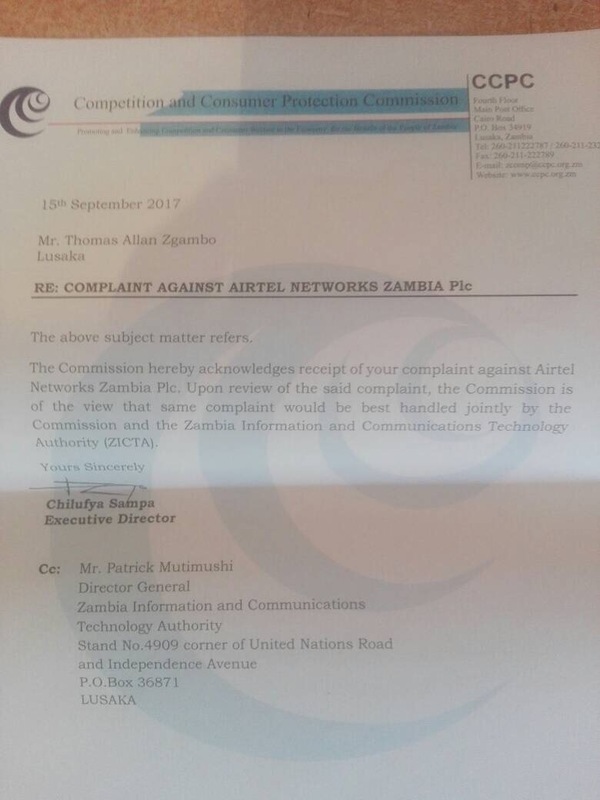 According to a letter signed by ZICTA Consumer Affairs Manager Edgar Mlauzi, the regulatory authority has since written to Airtel Networks to provide information requested. Meanwhile, CCPC in a letter dated September 15, 2017 signed by Executive Director Chilufya Sampa states that the Commission will jointly investigate the matter with ZICTA. Mr. Zgambo alleges that Airtel breached the provisions of article 65 of the Electronic Communication and Transaction Act that makes it illegal for anyone to intercept or procure someone to intercept communication. See copies of letters. The letter of complaint to ZICTA and CCPC has been deliberately edited to respect the third parties that had their privacy invaded.